This documentary about Parisians in the summer of 1960 can lay claim to having influential the course of cinema history. The filmmaker-anthropologist Jean Rouch and sociologist Edgar Morin, use the camera aggressively, often provoking his subjects to anger. 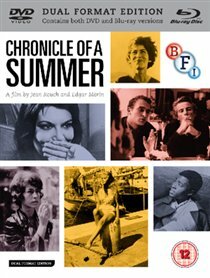 By simply interviewing a group of Paris residents in the summer of 1960-beginning with the provocative and eternal question “Are you happy?” and expanding to political issues, including the ongoing Algerian War, the film makers reveal the hopes and dreams of a wide array of people. As an epilogue, he invites all the participants in the film to a special screening, filming their reactions as they watch the often unflattering portraits of themselves. Chronicle of a Summer’s penetrative approach gives us a document of a time and place with extraordinary emotional depth. Chronicle of a Summer Special features.